I visited the Park in 2008 and stayed at the Boat Hotel in Boat of Garten (lovely place). My son Steven, who works on the oil rigs at Aberdeen, came over for a few days and we spent time together taking pictures of the immediate area around Boat of Garten. The Cairngorms National Park is the largest in Britain, covering 3,800 kilometres of beautiful and unspoilt countryside. 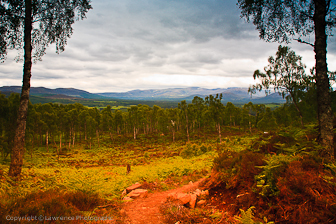 Boat of Garten is a small part of it but a great place to set-up as your base camp. Over 16,000 people live and work in the towns and villages throughout the Park area and every year thousands of visitors travel here to enjoy the fabulous scenery, from wild moorlands and soaring mountain peaks to spectacular rivers and tranquil lochs. The Park has something for everyone - whether it’s simply admiring the ever changing views of the spectacular mountains, or walking with a Ranger-led group learning about the plants and animals in native pine woods. For the more energetic there are plenty of opportunities to go mountain biking, canoeing or climbing. The area also has a rich cultural heritage with castle, fortified houses and estates all happy to welcome visitors. Hundreds of countryside events, outdoor activities, guided walks and talks take place throughout the Park each year. The photo web has been designed using Adobe Lightroom.